MINOR SPOILERS MAY FOLLOW. I do not spoil anything directly or intentionally but I do talk about various parts of the film in depth. I’ve gone on record in the past before as being a huge fan of post apocalyptic fiction, be it nuclear Armageddon, devastating war or just society falling around us for no other reason than to tell a story. One of my favourite films within this genre is Children of Men, an incredible film that is one of the most stand out pieces of cinema in the past ten years. One of the best parts of Children of Men was its approach to single shot takes: car chases, fight scenes and conversations often happen in long, unbroken shots that create both a striking documentary-like realism and a terrifying sense of tension when it calls for it (here is a brilliant cut up of every scene that is 45 seconds or longer in Children of Men. I warn you- it’ll make you want to watch the film from start to finish all over again). In my opinion, it is one of the best directed films ever made. Now, that same director Alfonso Cuaron (also responsible for my favourite Harry Potter adaption The Prisoner of Azkaban) is back with Gravity and, once again, his incredible eye for detail, camera work and editing has pushed the boundaries of cinematic experiences and has created one of the best films I’ve had the pleasure to see in the cinema since Jurassic Park. Some of the best posters I’ve seen for quite some time, too. 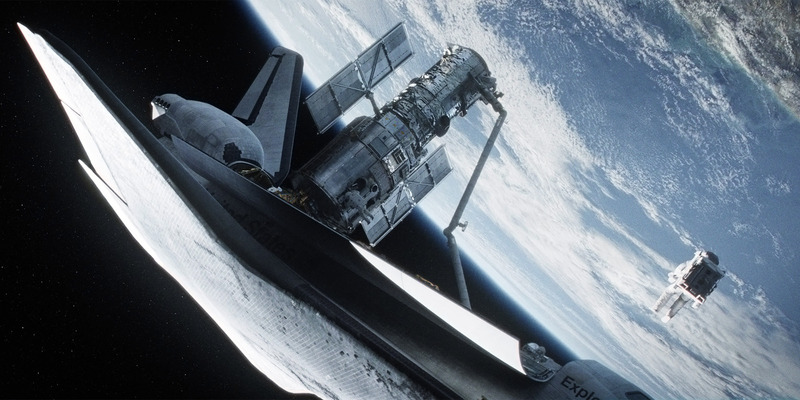 Gravity tells the story of Dr Ryan Stone (Bullock), an inexperienced astronaut on her first mission into space to install a technical maguffin to the Hubble Telescope. The only other real character in the film is Matt Kowalski (Clooney), an experienced and relaxed (almost to a point of cliché) mission commander on his last mission. From there, as you could have guessed by the trailer, everything goes unbelievably, catastrophically and breathtakingly wrong. I want to note, this isn’t me being light on the plot or avoiding spoilers something thing I adore about Gravity is that it’s a film that doesn’t labour itself with any kind of complicated story or plotlines and with its relatively short running time of 90 minutes, it certainly doesn’t hang around. Gravity knows it’s story and knows to not get hung up on details or drag out the audiences experience. Films are getting longer, there’s no mistaking it; and while I’m fine with taking your time to flesh out characters and story, I don’t understand why every thriller, comedy or action flick must now insist on dragging usually flimsy plots out over a hastily constructed 120/130 minute framework (Looking at you Man of Steel and the bloody Transformers nightmare marathon). 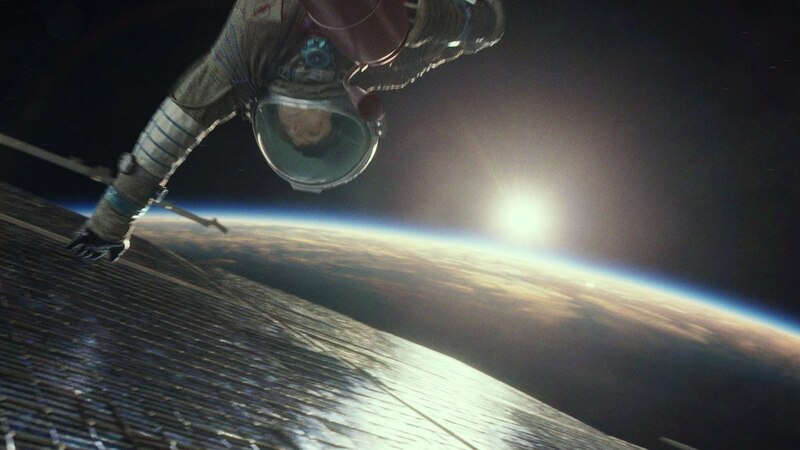 Gravity is gorgeously detailed in every aspect. You could get lost in every frame. 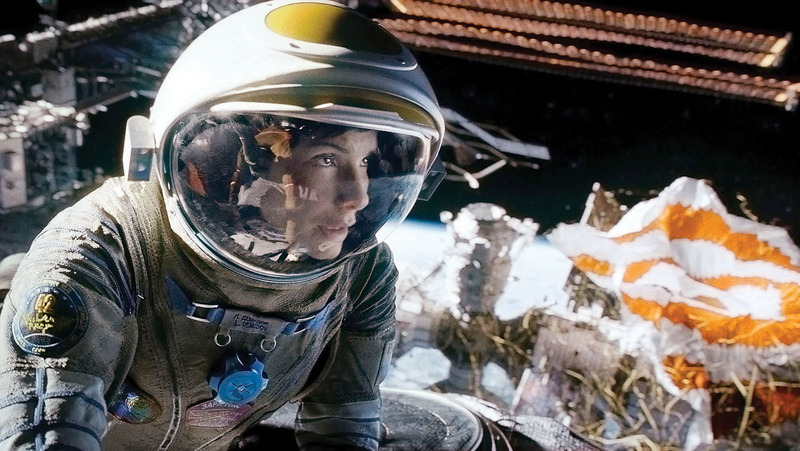 Gravity’s strongest point, however, comes in its visuals, sound and its lead actor Bullock. 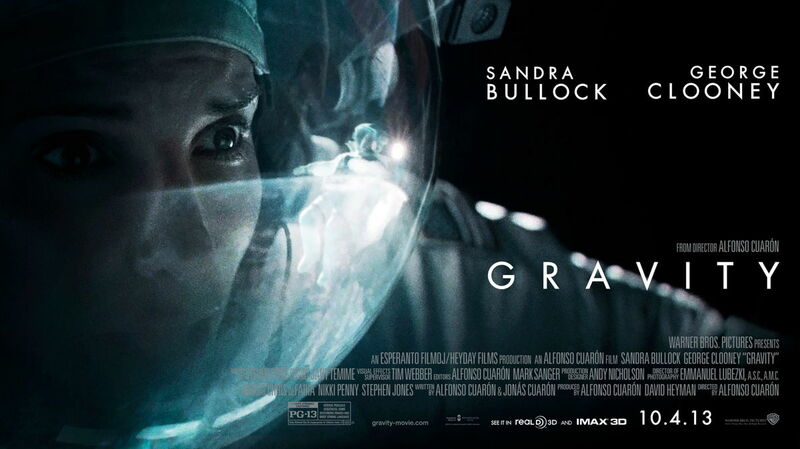 Since release, much ado has been made of the 3D and many people who openly disliked and disregarded it have gone on record that Gravity is the premiere example of how 3D can in fact enhance the experience of watching the film. While I was skeptical, after watching I agree completely. Before Gravity, I would have pointed to Life of Pi as the only example of 3D being used to a point that isn’t simply gimmick (and I’m sure Hugo would also fit in this but I unfortunately never saw it in 3D), however even in Life of Pi, I could only point to certain scenes that really stand out and not the entirety of the film when viewed as a whole. Gravity’s use of 3D is honestly revolutionary: it’s beautifully subtle when a scene calls for it and expressive and engrossing in others. Personally, I think much of this is to with the setting. Space creates such a strange and abstract background to everything that it in itself distracts from frequent ‘cut out’ or ‘pop up book’ effects you see in a lot of other 3D films (Avengers is what springs to mind the most). Space is, from a photographic or visual standpoint, flat. It’s almost impossible to gauge depth of field and distances in a void of stationary objects. This I think is the main reason the 3D succeeded in the way that it did. This isn’t taking away from Cuaron’s camerawork or editing however, or the CGI, just an observation of why this 3D experience seems to have changed so many minds. If anything, Cuaron’s unique style is another strong reason this film swayed so much opinion on 3D. There are so many countless moments in the film, for example a beautiful shot closing in on Bullock before getting close to her helmet and actually passing unnoticeable inside her own spacesuit, that keep you engaged with whats happening on-screen. Cuaron portrays this terrifying feeling of helplessness: so often Bullocks character scratches and scrambles along the outside of stations and capsules with gut-wrenching fragility. The entire film feels strangely like a nightmare; you try to run, to jump or climb but are struck lame or unable to move, and each second you get closer and closer to an edge that threatens to throw you into oblivion. When Bullock is floating helplessly against the backdrop of an empty, infinite space pock-marked with stars you feel helpless. For the first time in my life, Gravity made me feel the terrifying emptiness of space and it’s deathly, lifeless soundlessness. On top of this, Gravity certainly has a religious undertone; it’s references to The Ganges, shots of various religious symbolism, the shot of Bullock in the fetal position and various images of baptism and rebirth all lend themselves to the idea that Bullocks journey is a religious one. Gravity seems to go two ways with its views of technology. On one hand, a celebration of it and the adaptability and resilience of man- Bullock’s initiative and ingenuity within the film are amazing and epic celebrations of training and improvisation in face of what is the worst case of Murphy’s Law in history. However, on the other hand the film’s religious undertone seems to say that technology will never be our savior and that there is something else, something more metaphysical that cannot be accessed by our technological feats (an appearance of Clooney’s character later in the film cements this the most I feel). It’s a nice coincidence that both Life or Pi and Gravity have such a brilliant philosophical debate at their centre (not to mention Gravity’s underlying ‘shipwreck’ theme: as strange as it sounds, Gravity feels like the best portrayal of shipwrecks and being stranded at sea than anything I’ve previously seen) and makes my point of Gravity’s plot being relatively uncomplicated maybe just a bit shallow. I should probably try to wrap up as I could talk pages about this film but I would like to mention the sound design and Bullock’s performance as a particularly standout. Bullock has always been a bit hit and miss for me, however Gravity has really changed by view on her as an actor and I don’t think I’ve felt so emotionally invested in a character since Denzel Washington’s character in Flight. Dr Ryan Stone might no be the example of a perfect character and to be honest, some of her back story and set up was slightly cliché, however Bullock plays it so convincingly and honestly you fall for this character who is in so far over her head in the most insane situation ever. Her teary surrender when the soyuz capsule fails is heart wrenching after watching her fight through so much and makes her invigoration and new-found resolve to survive afterwards so much more impactful. Her character is an example of one saved by the actor’s performance- it could have so easily have been ruined by poor acting or even a misunderstanding of the character but Bullock pulls it off brilliantly. Finally, the sound. Oh boy, the sound. 2001: A Space Odyssey was always famous for its use of total silence in its depictions of the vacuum of space and Gravity is the film to finally perfect it. The transitions between the space suits, station and space itself have a brilliant continuity and uniqueness to each location be it the gentle hissing and clanking in the space station to the beautifully muted sounds of outer space. The contrast of an entire space station being ripped to pieces is on of the most incredibly jarring and strangely beautiful experiences I’ve ever seen. I can honestly say I’ve never heard a cinema so quiet. Anyway! I’ve gone on waaaaay too much and I could go on much, much more- I didn’t even mention the amazing WALL-E reference and nods to other science fiction films (keep an ear on who plays Huston). 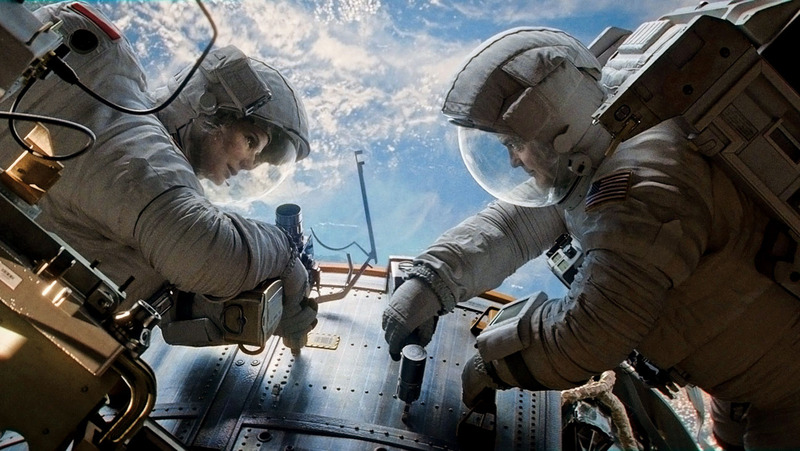 Thank you of sticking it out to the end and please, please go see Gravity while you can in 3D. I’ll certainly be getting it on Blu-Ray.